Everybody talks about “Made in the USA.” Here at Bellyak, Inc, we are 100% made in the USA. Sure, we could have our boats made in China for a lot cheaper, and we could sell our boats for less. However, not many people know what goes into making a plastic boat, and the quality control measures necessary to make an excellent product. My dad, Bill Masters, was the leading innovator in roto-molding for kayaks with his company, Perception Kayaks. My dad built his first ovens in Liberty SC and turned out boats such as the Quest, the Spirit and the Mirage in the early 80’s. The most sold kayak of all time was the Dancer, designed by my dad and my uncle Allen Stancil, and named by my mom, Janet. Bill Masters contributions to manufacturing innovation in the kayak industry are unsurpassed…few people outside the industry recognize his long reaching effect on the sport. He effectively took kayaking from a fringe sport enjoyed by a few and helped make it the multi million dollar industry it is today (props to you, dad). So it’s only natural that his progeny continue on in the family business…face first. The first bellyaks I built were made out of foam and fiberglass. After going through approximately 25 iterations, I decided to create a design that could be rotomolded. First, the boat design is translated into CAD….in other words, a digital image of the boat is created from the physical prototypes. Evan Solida, of 6ix Design, has been instrumental in helping me translate my rough prototypes into digital models. Back in the dark ages of kayak design, before internet and when people still had home phones, this was all done by hand. People like Allen Stancil and Jim Snyder would painstakingly carve every single facet of a “plug” before making a mold. This is an art form that is under appreciated by many of todays modern kayakers who aren’t familiar with what goes into designing a boat….a lot of work, a lot of dust, and plenty of trial and error. However, in the past twenty years huge strides have happened with technology and boat design. Now, boat design happens in the virtual world, where edits that would have taken weeks to make by hand can be completed in a matter of minutes by a skilled CAD driver. Once this is dialed in, and edits made, a CNC machine (think a super smart robot cutter) cuts an exact image of the digital model out of dense foam. Our CNC cutter is Tom McGuire of Digital Designs in Winston Salem, NC. In the photos below, the first photo shows the Frequency right after being cut. The second photo shows the same plug, but after being sprayed with primer and sanded to a super smooth finish. Once this was done, we shipped the plug off to a foundry in Texas, where our aluminum mold was cast. 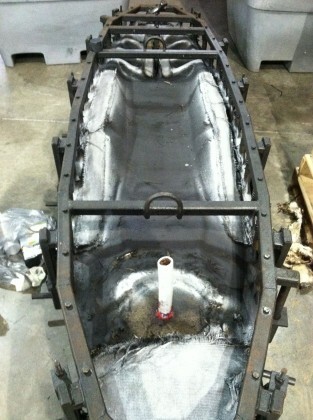 The image on the left is the mold prior to strategic shielding, and the image on the right is after modifying the mold. I used silver paint to reflect heat (reduces thickness of the plastic) and black paint to absorb heat (increases thickness of the plastic). I also shielded the front of the mold to reduce the amount of plastic that builds up on the ends. These are tricks I learned from being around rotational molding my whole life. What does this mean to you? It means I created a stiffer, lighter boat by working with the molders. Another reason why we chose to be 100% made in the USA. We were able to get the weight of the bellyak down from 35 pounds to 29.5 pounds, while increasing the stiffness in key areas.